We purchased “ Emilia “ at the 2007 FSFF sale at Bar 5 as a 7 month old heifer calf planning to add outcross polled genetics to our herd. Emilia has been developed here at Dora Lee and has become a very valuable addition to our herd. Her first offspring to sell (Evelyn) was a high seller at our 2011 Forum sale going to Black Gold in Saskatchewan. 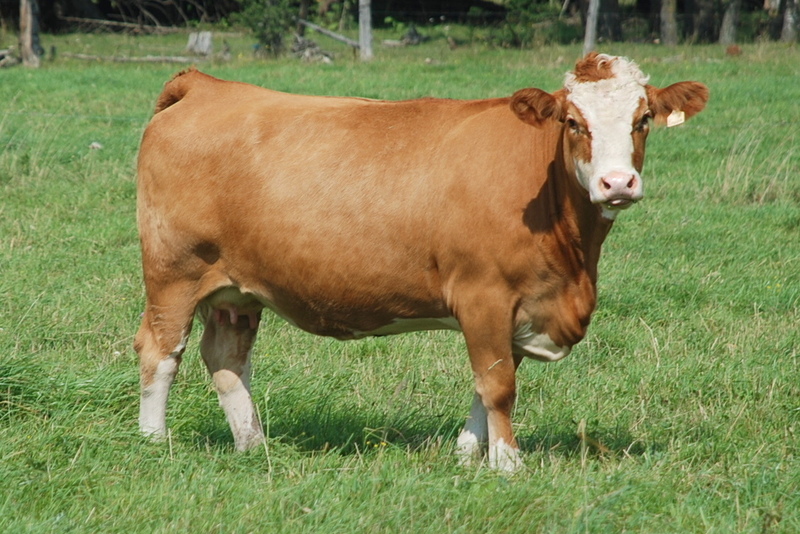 Then she weaned impressive twin heifers, both polled by DDD Broadway in the fall of 2011. 2012 started off with an impressive 94 lb polled bull calf by Myers Canadian Siegfried, “Huck” who is in our bull development facility and will be for sale in 2013. Emilia has impressive Genomic profile data and is ranked in the top 25% of our breed for feed efficiency. Emilia for not being 5 years old until March 29 has proven to us very early in her life that she can produce the good ones year after year.